Born in Nashville, Tenn., McKennon displayed a flair for the artistic arena early on, but was discouraged from pursing that talent. Rising above those early negative messages, McKennon was educated in TV and film production and ran a children’s theater for three years. He developed a variety of interesting skills. An avid naturalist and bird watcher, McKennon was also a member of the National Ski Patrol in New England. 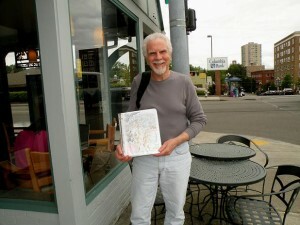 He has worked in all four corners of the U.S.
Saying he has been an artist all his life, McKennon has written and illustrated four books. His book, “You’re Moving Where?” focuses on an inner city boy named Gus, whose family moves to the country. McKennon weaves his story about Gus from the time the moving van pulls up to the happy ending with a visit from his city friends, who find the country is not really a scary place at all, but one that offers lots of good, wholesome and fun entertainment. Currently, McKennon is looking for someone to help him produce his latest book, “Willy the Wannabe Wallaby,” into a musical production. The two main characters in the book are Jabaroo Jack, showing values of tradition and preservation, and Khaki Man, who displays blind ambition at all costs. The book’s focus is the message that every single living thing has value, even though it might take people a bit of time to realize that. In addition to writing and illustrating the book, McKennon has completed the script and written poems, which have been translated to songs for the production. A music professor from Pacific Lutheran University (PLU) read the script and said he could easily visualize the play being produced.McKennon was thrilled. Saying that “Willy the Wannabe Wallaby” has broad appeal from youngsters to adults, McKennon said the book demonstrates the values of personal growth, friendship, community, self-acceptance, loyalty, self-realization and a strong sense of sacrifice. A music student from PLU scored the music for the play from McKennon’s poems. McKennon said he sees a lot of opportunities for aspiring producers, actors, singers, dancers, choreographers, and costume designers if the play were to make it to the big stage. Adding that he is always open to suggestions and advice that will contribute to the play’s potential, McKennon encourages anyone interested in helping with this production to call him at (253) 627-8303. Log in | 52 queries. 2.362 seconds.